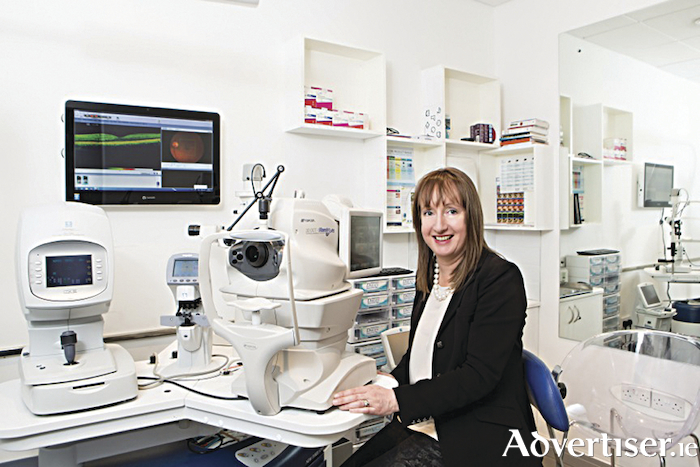 Elaine O'Sullivan FAOI, optometrist and managing director, Optique Opticians. Visit Optique Opticians for an unparalleled experience for high-fashion eyewear and sunglasses collections. Shapes are cat-eye or square and oversized, inspired by the fifties and sixties, or aviator styles for the enthusiasts of vintage. Glitters, studs, and gemstones abound and illuminate the face. Colours vary from midnight blues to carmine reds and with pop-art and tortoiseshell gracing the catwalks. Black is making a forceful return and is an absolute must-have for strong and determined characters with refined but decisive taste. Optique Opticians stocks collections from Dior, Oliver Peoples, Tom Ford, Vera Wang, Silhouette, Gucci, Prada, Oakley, Kate Spade, Face a Face, Prodesign, Adidas, and Carrera. Optique Opticians integrates high fashion with technology such as the 3D OCT scan (ocular coherence tomography ) which allows 3D analysis of the deeper structures of the eye. This 3D scanning and other advanced instrumentation facilitates early detection of eye diseases such as age-related macular degeneration (AMD ), glaucoma, cataract, and diabetic retinopathy. Optique also has new technology for the dispensing of bespoke progressive (varifocal ) lenses available which allows accurate measurement of head and eye movements which gives optimal vision at all viewing distances. Specific office and desktop lenses with high clarity reflection-free surfaces and blue light filters are available which offer comfortable, relaxed, vision while reducing glare and eye strain. Optique Opticians specialises in a wide range of sports sunglasses as well as fashion sunglasses. Whether it is for driving, golf, sailing, biking, or running there are a number of different lens types that provide 100 per cent UVA/UVB protection. Sports enthusiasts and athletes deserve the superior vision, protection, and performance of brands such as Oakley, Maui Jim, Bollé, Vuarnet, and Adidas. Optique Opticians' stylish state-of-the-art practice is located beside Dunnes at Briarhill Shopping Centre, Ballybrit, Galway. Visit www.optique.ie to book your appointment. Open Monday to Saturday, telephone 091 386669.